Warroad, MN – August 16th, 2018 – Raptor Performance Shocks (RaptorShocks.com), a leading Minnesota-based supplier of performance suspension products for such noted snowmobile brands as Arctic Cat, Polaris, Ski-Doo and Yamaha, announced today the introduction of their Kinetic Series shock absorbers. The Kinetic Series incorporates patent pending internal bypass technology for best in class ride quality and suspension performance. “The Kinetic Series Bypass technology has been in development for the last hand full of years in different configurations,” says Anderson. “Our current V1-RC package has been in the final validation stage of the program for the last several months. We’ve had a handful of key dealers as well as key riders’ white glove our production calibration with excellent feedback”. Matt Entz, owner of Mountain Skillz and native of southern Colorado, was another rider involved in the final validation of the Kinetic Series for the Polaris Axys RMK vehicles. 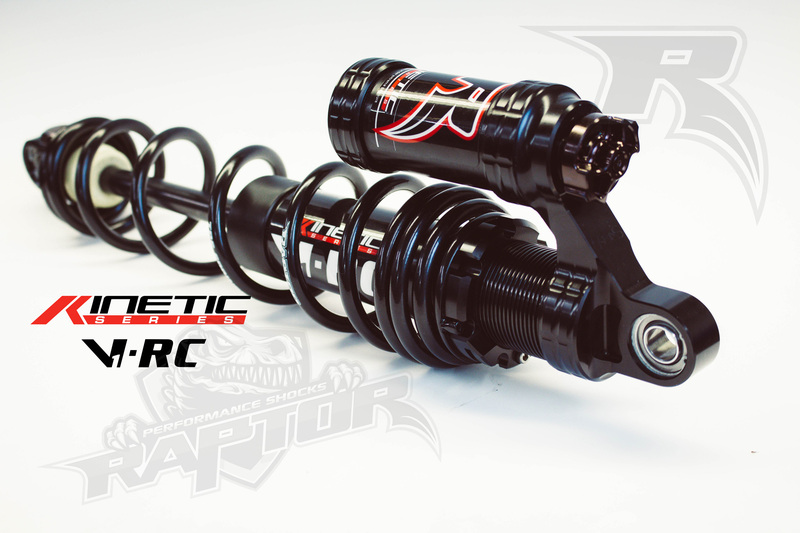 “I’m 100% confident that Raptor Shocks are the best performing shocks available. But what’s even more impressive is what Jake and his staff have been developing. They are about to set new standards in multiple aspects of snowmobile shocks! Their knowledge and passion is quite impressive,” says Entz. Raptor Shocks’s Kinetic Series shocks are available for pre-order for a limited selection of snowmobile models as the product is prepped for fall 2018 delivery. Product offerings will be added as calibrations are released for more snowmobile models. Raptor Shock’s encompassing inventory of suspension products includes full snowmobile shock packages, front suspension a-arms, shock service components as well as accessories. “The announcement of our Kinetic Series shock absorbers continues our tradition of providing premium products to enhance vehicle performance in addition to cementing our dedication to customers’ experience,” concludes Anderson. How and when can you preorder a set? Also will they fit on the 2018 model Polaris AXYS or do I need to convert to a narrow ski stance. Hey Troy! The Kinetic Series shocks are available for the Axys chassis in the new narrow React front end as well as the previous Axys chassis length ski shocks. Give us a call and we can help you get an order placed to beat the rush.